Anna van Milligen is Guelph-based installation artist who is interested in how women construct identities and perform their femininity. Her choice of media includes fake hair, faux fur, and dollar-store beauty enhancements. Van Milligen’s most recent work “<3” for Lèche Vitrine, was reminiscent of a cosmetic advertisement, where a woman’s fingernails uncannily metamorphosed into long silky hair. For CAFKA.18 the artist created an installation in the Berlin Tower Gallery of the Kitchener City Hall called “Church.” Her chapel-like treatment of the space continues her investigation into the fetishization of feminine glamour. 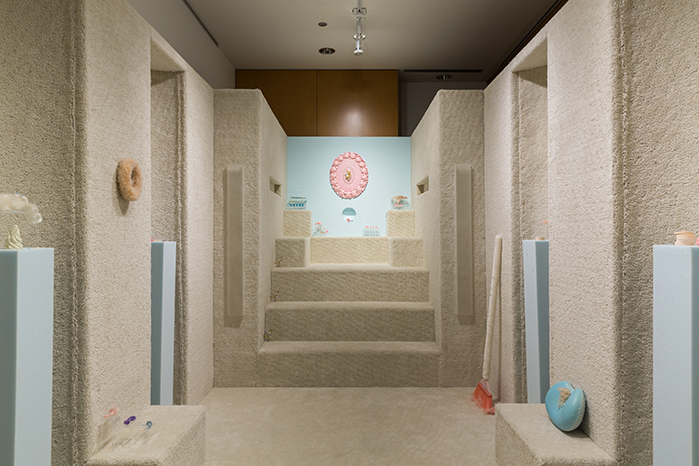 In her installation Church, the artist orchestrates a palette of pastel colours, plush textures, glamour accessories, sentimental trinkets amd plastic figurines, household hardware and odd miscellany into an immersive environment which is at once seductive and absurd. Organized in the form of the nave of a church with shallow chapels on either side and with broadloom covering the walls and floor, the visitor is drawn to the central feature of the elevated "sanctuary": a large oval piece of rocaille-inspired assemblage. Carefully arranged around it are pink and blue plastic figurines locks and braids of gold and platinum dolls' hair. In the middle, a shallow hemispherical niche frames a pink polyester rose, two play-cigarettes and white kitten stickers. Anna van Milligen received her BFA in 2013 from Calvin College, Grand Rapids, Michigan, and her MFA in 2016 from the University of Waterloo. A recipient of the Keith and Win Shantz Fellowship and the Ontario Graduate Scholarship, van Milligen recently completed her MFA at the University of Waterloo in 2016. Anna van Milligen's Church has been made possible with the support of VIVE.